For decades music lovers have depended on Marantz amplifiers to power their systems. For decades music lovers have depended on Marantz amplifiers to power their systems. Why? Maybe the solid build quality and reliability won them over. Quite possibly it's that warm, transparent Marantz sound. Or simply the way Marantz amplifiers have a knack for pulling even the most subtle nuances out of your favorite recordings — details you may have never heard before. We think it's probably all of the above, and judging by our customers' overwhelmingly positive reviews, so do they. And it's for all of those same reasons that we're so impressed with the PM7005. 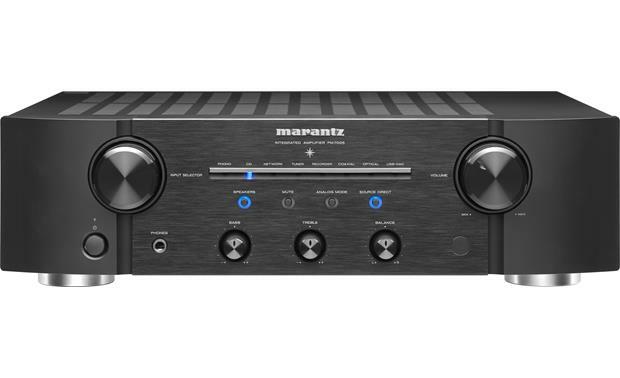 This powerful integrated amp boasts the classic hallmark qualities that make a Marantz a Marantz, plus it offers versatile features and connections that make it the perfect choice to be at the center of any modern hi-fi system. While many integrated amplifiers have only analog inputs, the Marantz PM7005 features digital inputs, as well. Connect your computer via the asynchronous USB input and enjoy your entire library of digital tunes through your favorite speakers. The PM7005 is compatible with high-resolution music files, including DSD files and 24-bit/192kHz PCM files. An audiophile-quality digital-to-analog converter (DAC) makes the most of them, for outstanding levels of detail and dynamic range. 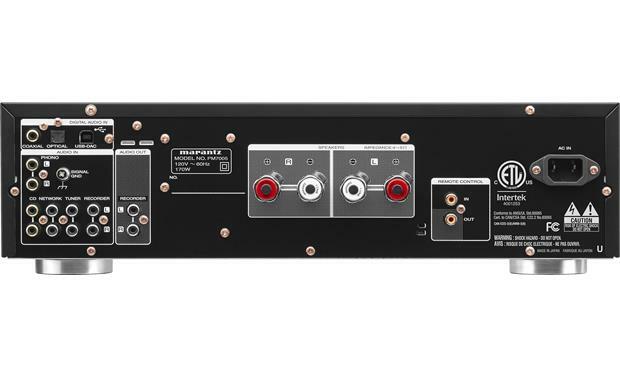 Optical and coaxial digital audio inputs let you connect other sources like a TV, CD or Blu-ray player, or a network streaming device. And there's plenty of room for your analog sources, too, including your turntable. The PM7005 features front-panel treble and bass controls, and Source Direct mode for bypassing these tone controls if you desire even purer sound. The Analog Amp mode simply switches off the digital section completely, allowing you to enjoy the purest analog audio possible — perfect for vinyl playback. There's also a discrete headphone amplifier for the full-size headphone jack, for late-night music listening that won't disturb others. If connecting to a TV, please make sure you can select "PCM" output in its audio menu. The built-in DAC is not compatible with Dolby® Digital signals. Excellent! I have wanted a Marantz system for many years. Not in any way disappointed! how would you connect an ipod to the PM7005? The only way I am aware of to connect an Ipod without additional hardware would be through the analog inputs. My understanding is that the USB input on the DAC can only be used with a computer. Marantz Proprietary HDAM SA3 Technology: Marantz's exclusive HDAM SA3 technology features precision discrete components that provide wide dynamic range with low distortion, outperforming conventional op-amp integrated circuit chips. HDAM SA3 modules are used in the digital audio converter stages as well as the critical analog audio stage. 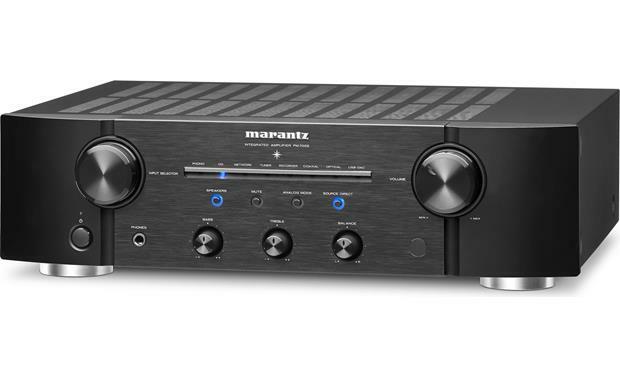 Current Feedback Amplifier: Marantz proprietary current-feedback circuit, using discrete components, is adopted in the pre-amplifier and power amplifier section of the PM7005. Equipped with multiple high current wide range power transistors, the PM7005 features the ability to handle low impedance speakers, and is rated at 60 watts per channel into 8 ohms and 80 watts per channel into 4 ohms. The output stages feature current feedback (originated by Marantz) instead of voltage feedback, for the lowest distortion and highest stability. High Current Power Supply w/ Short Power Line Layout: Featuring a high current high capacity shielded toroidal power transformer, the power supply section also employs high current high speed Shottky Barrier Diodes, along with high current storage capacitors that together provide wide dynamic range along with low impedance drive capability. For strong momentary current supply, a short power-line layout unifies the power circuit and output stage of the power amplifier section. This layout allows connecting the large-current lines via the shortest route while to arranging the left and right channels symmetrically. Reference Quality DAC: The PM7005 is equipped with a reference class CS4398 24-bit/192kHz DAC for exceptional sound quality of your digital audio sources. The digital audio section is housed in a shielded compartment to prevent interference with the analog audio circuit blocks. Analog & Digital Inputs: In addition to four other analog line level inputs, the PM7005 also features a dedicated phono input, for compatibility with moving magnet turntables. Both optical and coaxial digital audio inputs are provided, for compatibility with a wide range of digital audio sources (2ch PCM only; 32-192kHz). There is also an analog record output. The analog inputs/outputs and coaxial digital input are gold-plated for optimum signal transfer. USB Type-B Port: The integrated amplifier can operate as a soundcard for your Windows PC or Mac computer using its asynchronous USB-B port and built-in DAC which allows for "bit-perfect" support of 24-bit/192kHz and DSD 2.8/5.6MHz high-resolution audio. The PM7005 supports Windows 7/8 and Mac OSX 10.6.3 or later. You will need to download a dedicated USB audio driver for Windows PC. Audio Settings: The Marantz PM7005 offers a variety of audio setting to improve audio performance and enhance your listening experience. Source Direct Mode: The Source Direct function bypasses unneeded circuit stages (such as the tone controls) for the most direct audio path from input to output. Analog Mode: If Analog mode is turned on when playing back an analog input source, power to the digital input circuit is turned off. This prevents the analog signal circuit from being affected by noise generated by the digital control circuit, resulting in high quality audio playback. Tone Controls: This unit has a tone control function for adjustment of bass (low frequency) and treble (high frequency) sound to produce your preferred sound. CD Direct Buffer Amplifier: This is a high-speed buffer amplifier made with discrete components, which avoids interference between right and left channels and can send the signals to the pre-amplifier with very high fidelity. Fully Discrete Headphone Amp: For superb sound quality with the widest range of headphone types, the PM7005 features a fully discrete headphone amplifier that is able to handle just about any headphone type, regardless of impedance or sensitivity. The high quality gold plated 1/4" headphone jack is compatible with audiophile and studio headphones and adapters. Heavy-Duty, Gold-Plated Binding Posts: The PM7005 is fitted with four heavy-duty, gold-plated binding post terminals for long life and optimum signal transfer integrity. The binding posts will accept banana plugs (single only), pin connectors, and bare wire (up to 10AWG). Aluminum/Glass-Reinforced Resin Front-Panel: The integrated amplifier's front-panel uses a carefully chosen combination of aluminum & glass-reinforced resin to create a distinctive three dimensional appearance. Indirect reflecting blue LEDs indicating input selection and heighten its elegant appearance. Remote Control: Featuring an easy to use ergonomic design, the elegant remote control can also be user to control a Marantz CD player or network player (sold separately). Remote input and output terminals let you connect the PM7005 to other Marantz components, such as a Marantz CD player or network player, allowing you to place the PM7005 out of sight (such as in a cabinet) yet still providing full remote control capabilities. Protection Circuit: The PM7005's Protection Circuit prevents damage to devices within the power supply when an abnormality such as an overload, excess voltage occurs or over temperature for any reason. If a malfunction occurs in this unit, the power indicator blinks red and the unit switches to standby mode. Hi can anyone suggest best suitable speakers for marantz pm 7005? Budget 1000 euros. I use this to drive my magnapan .7. They are 4 ohm and sound fantastic. Can you use the Recorder Audio Out for a subwoofer? If so, would it be a line level (so, volume changes wouldn't affect it)? I didn't add a subwoofer and I am not sure you can. You might call Marantz there customer support is very helpful. Great amp. This output is not affected by the volume control, so I would not use it for a subwoofer. Would an Apple TV suffice as the Apple Dock to connect an I Pad, I Phone, or iPod to the PM7500? I forwarded your question to an Advisor and they responded with the following: An AppleTV is not a dock where you would physically connect your iPod/iPad/iPhone to. The Apple TV does connect to your home internet and can play files saved on a computer in iTunes on the same internet connection. Using the AirPlay feature you can also stream audio and video directly from an iPhone or iPad through the Apple TV to then play on your TV and/or audio system. If you would like to discuss further you can contact an Advisor directly by phone (1-800-324-9695) or online chat. To connect your iPhone, iPad or iPod to your home stereo you just need an Apple Dock and a 3.5mm to RCA cable.The RCA cable plugs into the rear of your stereo using any line in input, like Tuner or whatever, and the 3.5mm plugs into your iPhone dock jack. In Tech talk....."It should work.? I connect apple tv to my 7005 and the ipod connects/play through apple tv. The overview indicates both A & B speakers. Looking at the connections, only connections for 2 speakers exist. Does the PM-7005 really support 2 pair of speakers? I forwarded your question to an Advisor and they responded with the following: Not sure where it lists the Marantz has A and B speakers, because I couldn't find it. Regardless that model does not have A and B capability. It will only power one pair of speakers. It is 4-ohm stable, but is only so it will work with most speaker brands. If you would like to discuss further you can contact an Advisor directly by phone (1-800-324-9695) or online chat.